Priced: $85.83 - $170.00 Rated: - 4 stars out of 5 by 114 reviews. The KEEN Bern Baby Bern Boot makes you feel comfortable wherever you roam. This women's boot features a water-resistant leather upper with a medial side zip and decorative buckles. The polyurethane midsole and polyurethane outsole of the KEEN Bern Baby Bern Boot offer support and traction. KEEN.CUSH is a blend of recycled PU, cork and memory foam that contours to feet and adjusts to give you the cushioning you need throughout your day. Inset elastic goring panel in top of shaft with strap and buckle detail. Water resistant leather upper is designed to last. Dual side buckles for adjustability. To treat day to day wear and tear, especially on lighter color leathers, we recommend using a leather cleaner and conditioner, found at most footwear dealers and/or shoe repair shops. Burn rubber and jet-set around the world in the Keen Bern Baby Bern Boot. Full leather and a high-shaft design make the Bern Baby Bern desirable for international or downtown adventures. Decorative buckles add class but maintain simplicity, while a full side zip and wedge heel round out this Paris-worthy piece. The Keen Bern Baby Bern Boot for Women is fashionable enough to take you around the world, yet so outrageously comfortable they’ll make you feel right at home wherever you are. The classic high-shafted upper is complimented with a wedge heel, full medial zip and handsome decorative buckles for support and simplicity in a great looking package. The women's Bern Baby Bern Boots from Keen are extremely comfortable with loads of fashionable detailing. Wear them with your favorite jeans or pair them with skirts or dresses. These tall Keen Bern Baby Bern boots have wonderfully clean lines and rich leather for refined appeal without compromising everyday fit and comfort. You don't need no water! Let the 'Bern Baby Bern Boot' put your style on fire. I just got these boots and have not had a chance to wear them for a full day, but they have a great design and the footbed is very comfortable. I have other Keen shoes, and expect that these boots will live up to my expectations of exceptional comfort without a break in period. As for sizing--I wear a 6.5 usually, and, following other reviewer's advice, ordered 1/2 size up. I'm not sure I needed to do that--the fit feels a tad too roomy, but I often use inserts, so I'm not too worried. I also ordered the 7 because I wanted the Purplie color, and it was sold out in 6.5. Like some of the other reviewers, I have muscular calves, and my legs are short, so I appreciate the shorter shaft and larger leg opening, which is just right (the side buckles are real, and can be tightened for those with slimmer legs). Back to the color--that is probably my only disappointment. I was hoping for something that really had a burnished purple cast to it (which is how the web image looks). That would have been so cool...but the actual boot is not really distinguishable from a dark, dusky brown, though the stitching down the front is definitely purple. Keen designers: next time, go for it and make some boots of leather that is really purple, and I bet Keen fans all around the globe would start a stampede to buy them. Oh, I gotta add that the turnaround time on the shipping was awesome! I ordered these boots on Tuesday night, requested the standard free shipping, which is supposed to take 7-10 days. I received them in TWO DAYS. Wow. That's impressive. These were difficult boots for sizing. I love the Purple color, and the style, but it took me a few tries to get the size right. I usually wear an 8½, and have always worn 8½ in Keens. When I got the 8½ in these boots I instantly thought it was too small - a part in the toe box was squeezing down on my toe-knuckles and it hurt! I was going to return them and get 9, but then I read a review that said the person wore them for a week straight and by the end they had stretched out to a full size larger! So I wore the 8½ at home all day, and sure enough they stretched out! Then I got the 9 just to try them in case. They were way too roomy in the ankle part, although the toe box was much better. I decided to keep 8½ and take out the Keen insoles, put in my own memory foam insoles. They are fitting perfect now! Other reviews that say the grip on the soles is not good are partially right. They do slide around a tiny bit on carpet, but outside they are plenty grippy. These are cute boots, I highly recommend them. Break them in a little to stretch out the leather and I am sure that you will love them! These are quite possibly the most comfortable boots I have ever worn. I have 3 pairs I love them so much.I have had them for 2 years and they still look great. I wear these more than any other shoe or boot I own. Definitely the most comfortable. I can wear a pair of knee high Smartwool socks, just ankles socks, leggings or skinny jeans with them and they are still comfortable. I have athletic calves, not too big, but not tiny and they fit great. The boot will relax as you wear them, so if the calves are tight, just keep wearing them. I wore these boots only on a 2 week trip to Europe(which equals tons of walking) and just barely to Disneyland for 2 days which can be pretty tiring for any legs, but mine were just fine! Footbed is so comfortable. I just can't say enough. I get tons of compliments and at least 5 people I know bought these boots after they saw them on me. They rock. Plus they don't have the obnoxious Keen toe, so that's a bonus. I haven't had traction issues with mine, like another review said, so basically these boots are amazing. I am a standard 8 in shoes and wear an 8 in these. I've been looking for a pair of comfortable but stylish knee high boots to wear over jeans for years. I wanted a boot I could walk around in all day with comfort. This boot gives that comfort and fits over my jeans that are a thinner material. They also have some arch support and cushion which most boots don't seem to have and I need. I also wanted them to be leather without any lining so they're not too hot and I could wear them for a longer season. This boot has that too. I basically wanted a boot I could get a lot of use out of and I think I'll be able to do that with these Keen boots. (I bought these in black)I gave a 5 star rating because of all of the above. I also like the look of riding boots with more of a heel for a dressier look but, I haven't found that look that's comfortable. The only drawback would be that I wish I could wear them over my jeans that are a heavier material. I think if someone had wide calves that they wouldn't be able to wear them over even thin jeans. I have had mine for a couple of months now and they have worn in very nicely. I was torn between these and the Silverton, because I wanted something kind of rugged but cute at the same time. Ultimately, I liked the overall look of these better - too bad they don't offer the same features of the Silverton with this look. Anyway, they are a nice quality leather. They are water "resistant", and having splashed water on them a few times, I can say they dried with no visible signs of having been wet. I did, however, wear them to a concert and spilled beer all over them which stained the leather... I cleaned them with glycerine soap and a little Murphy's Oil and the stains disappeared. Someone commented that they were slick - I've worn these on my icy wooden deck and didn't seem to have any trouble. I get compliments on these every time I wear them. If only they were waterproof, I'd give them 5 stars. Also, I find they run true to size. 1) I have athletic calves and they fit perfectly-comfortably snug but I don't have to fight to zip 'em up. 2) They are stylish--no, adorable--and yet very well made. .I can wear them on a museum jaunt to San Francisco or on a midday mini-hike in the redwood forest behind my office at UC Santa Cruz. 3) They are warm and waterproof, but not hot indoors. 4) They don't come quite up to my knees, which is good, b/c I am short, so they stop at a flattering height. 5) My boyfriend calls them my superhero boots. He's right! I can do anything in these boots, all day. I now own two pair, one in the lighter "Oak" and one in "Purplie" (a color from 2011). I even bought a pair for my sister in Portland. She loves them, too. These boots are great. I hope Keen never stops making them. The buckles appear to be merely ornamental, so don't depend upon them for anything more than that. Seems true to size as well. Padded footbed has plenty of room for my average width foot while still offering support. 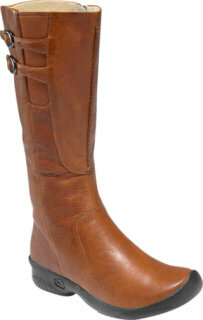 The shafts are not lined, but the leather is soft, thick and supple and is cozy without being too warm for indoor wear. Perfect! These are good casual boots with a functional design. I bought a pair in green. The shoe is a full size smaller than the usual Keen last. I had to pull out the footbed and replace it with a thin Specialized insole just to get my foot inside the 9.5, when I normally wear a 9 in Keen. They are still a bit snug. I'm still trying to decide whether to return these boots rather than endure a seriously uncomfortable break-in period. I don't believe in wearing shoes that must be "broken in". The calf fits okay. I'm a medium-sized woman (8/10). While researching this product, I found a review on the REI website left by an irate, self-describe size 14 woman who was left "feeling fat" because she could not zip up the boot. If you are a larger woman, don't even bother placing the order. If you are a smaller woman, you will have a loose boot-top, perfect for tucking in your pants. I love Keen shoes so I was not surprised that I quickly added these boots to my list of favorites! I am tall with a big foot (size 11) and these fit perfectly. This fits just like my other keen shoes: very true to size. I love that these can be dressed up, yet I can still wear them to the pumpkin patch with some skinny jeans and a hoodie. There is plenty of room in the calf area; I actually wish they were a bit more snug, but this way I can wear pants that are not that tight and they fit in the boot just fine. I tried tightening the 2 buckles, but that creates a wrinkle down the outside of the boot and looks funny, so the buckles are definitely only for decoration. There was no wear-in time, they were comfortable out of the box. If you are on the edge with these boots- get them! You will not be disappointed. I bought these boots in black last winter and loved them straight out of the box. They were super comfortable, fit great, and were easy to wear with just about any outfit. I wore them with Superfeet insoles, but they were definitely comfortable on their own. I would say I used them most days to get to work/class or wear around town, but nothing out of the ordinary. Overall, I was disappointed in the quality/durability of the boots. That being said, if they had lasted more than a few months, I'm sure I would still be wearing them today! Tried on 2 pairs @ store -- I usually wear a perfect 9 but had to go to 9.5 for width (fine, that happens sometimes but NEVER with Keens). At the store, I noticed a very strange tension across the widest part of my right fit. Tried a 10; HUGE. So asked for a different pair of 9.5, perfect. Whatever. Ordered them online b/c of an online-only giftcard and of course the pair they ship to me has the same problem -- right size feels so narrow I cramp almost as soon as putting it on. What is the deal, Keen? Usually they tend to run so wide. The calves, as others with long skinny legs have mentioned, are enormous. But the rest feels so narrow! There's a little tag attached that says, "Every pair of Keens is different!" Yeah, no kidding. How about a little consistency in sizing? Returning tomorrow HOPEFULLY to find pair that fits. These were the most comfortable and attractive boots I'd found in years, and sold as good for "city streets". When one of the soles on my first pair split (side to side, all the way through) after five weeks of wear, I assumed it was a defective pair. I returned it to to REI and, because I trust Keen's overall quality, I got another pair...two, in fact, black and the light brown. Now, after about two months' wear, one of the soles split. I walk anywhere from two to five miles a day in the city, and was clear about that with the sales rep. I can only think Keen's description of this boot is not accurate. The boot are overall very comfortable and very stylish, but replacing them every 6-8 weeks isn't very practical. I loved these boots so much I bought them in Oak and Black. (I had the low Baby Bern Boots) I got so many compliments on them whenever I wore them. A friend even ordered the high ones in Black after seeing mine. I ended up returning both pairs today because the soles split starting from the inside ball of the foot to the center of each boot. There was hardly any wear on these boots, in fact, you could still see all of the pattern of the sole. My friend's boots have split too and she will be returning hers. The customer service rep at the store I returned the boots to, said her's did the same. Keens usually are so durable but not these! I was looking forward to the arrival of the boots! HOwever, I was disappointed with the seam on the front of the boot...it is whitish and doesn't blend in well with the beautiful oak color. Not sure if it is a flaw or the white seam is stylish? The bigger reason I am returning the boots is because it was a poor fit over my calves. When I tried on with skinny jeans, I had to force the zipper closed. I am average size, but this boot doesn't fit my legs:(. Not only is the fit snug, the top of the boots end at the widest part of the calf, which isn't too flattering! Bummer. I should have known they wouldn't work when they glided across the carpet in the store. These boots are cute, comfortable, and have quality workmanship. True to size for a 6. I was elated there was no huge rubber toe bump. But on a wet Seattle afternoon, they have no traction on grass, cement, or pavement. So disappointing for a Keen. If traction was not a concern, I would have bought a high-heeled boot. Why would Keen do that? Exchanged them for boots by Merrell. Received a pair of these boots for Christmas from my husband. I was so excited because I had always wanted a pair of knee high boots to wear with leggings. I am totally disappointed!!! The boots fit well in the foot, but I can only get them zipped up half way. There is not enough room in the calf, my calf is 16" wide. I can't believe that a person my size (14) cannot wear knee high boots. I am disappointed and feel really FAT! I bought these two months ago for the coming wet & cold weather, and have been wearing them once a week since then - nothing out of the ordinary. This morning when putting them on, I realized the sole on one boot had completely split in half - and the other is on its way. Really disappointing for a Keen product. I'll be taking the boots back - but getting a different brand. I wanted to love these so much. I was so excited to get them. Unfortunately, they were huge on my calves. I'm tall and slim, but I was hopeful. My husband said they reminded him of barn boots! And, along with another reviewer- they are very slippery. Not very good in the northwest. super bummed, I returned them. I absolutely LOVE Keen shoes, but this boot was one I couldn't buy. The sole is so slippery that I was sliding around on the dry carpet in the store. Imagine going down in a slick spot on the street, or in a grocery store... NOT! Total bummer. Why did Keen do this? NO TRACTION! I've had the Keen Bern Baby Bern boots in Oak, sz 9, for 4 months now. Granted, I've worn them a lot, but I've also tried to take good care of them (leather conditioner, water proofer, keeping them as dry as possible, etc). I chose them out of several other styles I tried on because they fit my chunky calf better than others and still had a classic design that wasn't too bulky. They were comfortable from the beginning (though ended up adding another insole because they aren't as comfortable for extending standing or walking), have been warm, and for me the slick-ish sole hasn't been a problem. Lately I've been noticing they look REALLY worn--not like when you get to the comfort point and they are just worn right, but starting to look really creased and worn out (surprising for only having had them for 4 months). But now--the zipper has broken. The zipper teeth on one side started to separate a couple weeks ago, so I tried to be really gentle with the zipper. But it's come off the track now and I can't seem to get it back on (And even if I success there are two places where the zipper teeth have some apart). So overall--I'm disappointed. I feel like a solid pair of leather boots should last at least a few seasons. Got these in Fall 2011 for rainy Seattle weather and long walks at work to and from the building. These are great and water resistent and I've never had wet toes at the office. They're also very warm indoors when worn with jeans tucked in. Also great in slippery conditions even though the soles look smooth. Unfortunately after a year the soles are cracking due to the diamond/cross-hatch pattern on the bottoms, the cracks ran right across the ball of the foot from the inside to the middle. Not happy about this at all! I've had Keen shoes in the past that lasted until I wore the soles through not crack in half! I'll be looking to either return these to the store or trying to deal with a warranty with Keen, there is no reason these should fall apart in a year when they're only worn intermittantly on very stormy days. I ordered these hoping that if I ordered them a size larger than usual I would be able to make them work with my large calves. My calves are around 16-16.5" and this circumference was listed at 15.5". I've had another pair of leather boots that were 15.5" which after some stretching worked for me. In a size 8 the circumference on these was more like 14.5". These, unfortunately, wouldn't even zip past my ankle. They are very cute and with trim calves I'm sure would work very well. I was just hoping that with the elastic and being high quality leather I would be able to get them to stretch to work, but it was not even close. Probably like all high boots, these will work for girls with skinny legs, but athletic calves need not apply. It's too bad because the boots were very cute and seemed well made. I was really excited about these boots when I bought them last fall (2010). They were cute, comfortable, practical & waterproof; everything I had been looking for in a city boot. I walk a lot & took these with me on a winter trip to China where they kept my feet warm & dry, but the insoles broke down (as in completely fell apart) after about two months & they were no longer comfortable for longer treks, even after trying an aftermarket insert. Then over the spring the zipper on one of them broke. I'm not hard on my shoes, but I do expect to put a lot of miles on them & these just didn't cut it. Bottom line, if you plan on wearing these casually, they'll probably work for you. But don't expect them to survive more than one season if they're your daily footwear choice. I received these in the mail today so no chance to wear them yet. Let me say they are very stylish, love the forest green color, and they feel very comfortable to walk in. The problem is the leather appears to be scuffed and or scratched. They appear brand new but the marks look as if someone wore them and scuffed them up. I didn't see anyone else comment on the appearance of the leather. I'm going to return to REI and ask them if this is what they should look like or whether this pair is defective. I had these boots for a little over a year, any they were great. The sole is pretty smooth so they were slippery on ice, but warm and waterproof enough for snow or running errands on a rainy day. Comfortable and I was able to wear them to work or out with a dress. To be fair I wore them a ton. And then the sole split in half. Right under the balls of my feet, on both shoes. Very disapointed. I honestly expected them to last a lot longer for the price. I have LOOOVVVVEED these boots, but after less than a year (and only four months or so of wearing them on a regular basis - didn't wear them much this summer) the zippers on both boots are breaking at the ankles. I was hoping to hang onto these for several years, so I am pretty disappointed, considering how much they cost. Apart from this, though, I have loved every single thing about these boots. My wife would love to get these boots, but they aren't sold at REI in size 5.